LOVE, LOVE, LOVE, these quick and simple gift cards! 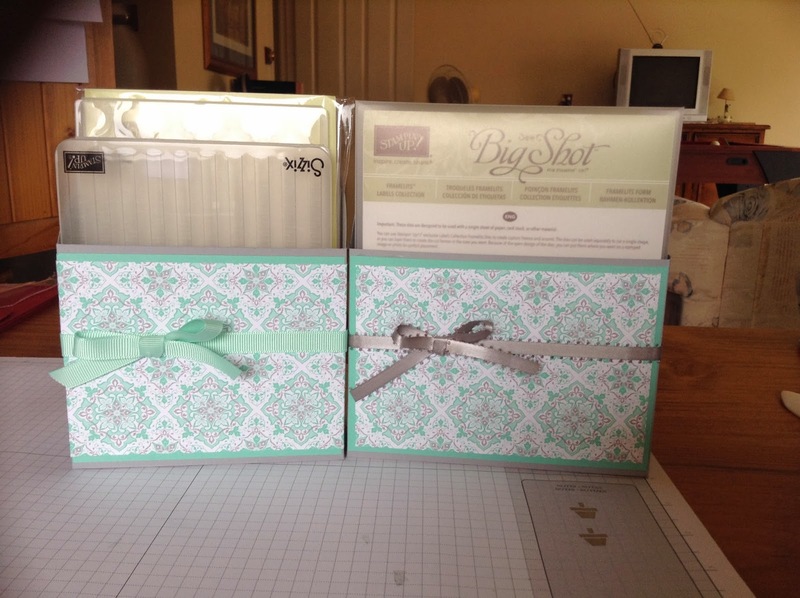 Cut whisper white cardstock 6″ x 3″ and fold in half. 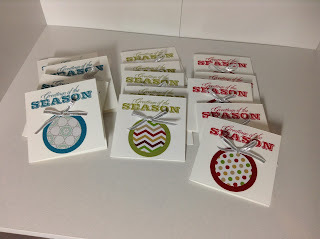 Using 1 3/4″ circle punch, punch a circle using coloured cardstock (I’ve used Island Indigo, Old Olive and Cherry Cobbler). Adhere to card, close to base. 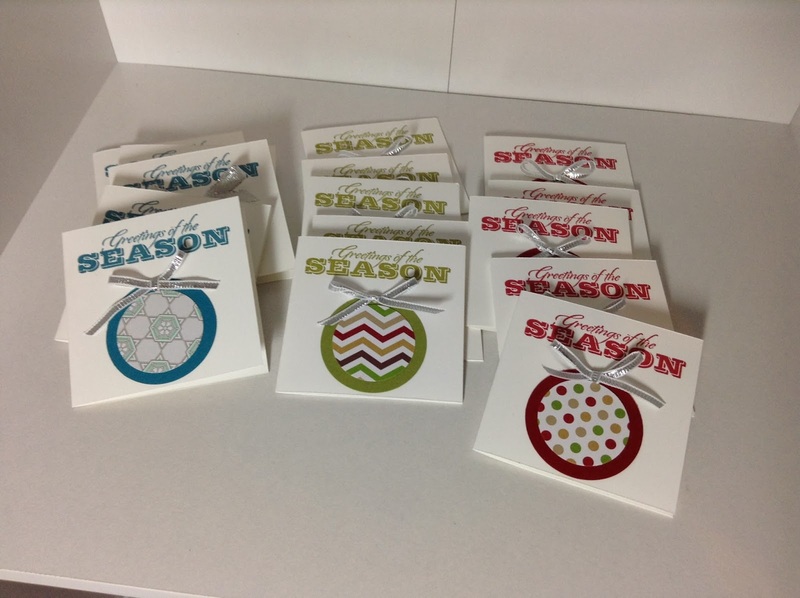 Using 1 3/8″ circle punch, punch a circle from DSP (I have used the Seasons of Style Paer Stack and the Winter Frost Paper Stack). Adhere to centre of coloured cardstock circle. Use 1/8″ silver ribbon to make a bow and adhere to the top of the ‘bauble’. Woo Hoo! Finally got to make a start on my Christmas Cards, using the retired Medallion Stamp (I was sorry to see that one retired). Loving my envelope Punch Board – at the moment it means bows in any colour or pattern I desire. Absolutely love how these have turned out. Happy Crafting! I had a lot of fun making these today to ‘pretty’ up my craft room and store my embossing folders and framelits. These are from ‘Pootles Papercraft’ and you can watch her You Tube how to video by clicking here. I made mine from smokey slate cardstock, made it a bit stronger by adding an extra piece of coastal cabana card stock, then used Eastern Elegance DSP to pretty it up, and finished it off with some ribbon that I had lying around. So have some fun and Get Crafting! 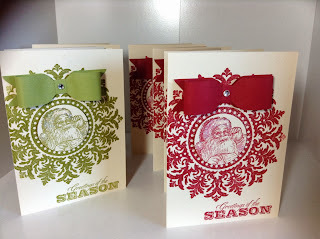 I have cased these ideas from Pinterest…what a brilliant site! Let me know what you think 🙂 I have tutorials available and will post a kit with everything you need (except stamped images) to make your own ones of these for $20 if you are interested. Well, here goes! I am embarking on my very FIRST blogging journey. I am excited and nervous, as I have absolutely no idea how to do this, but I am willing to give it a go 🙂 So wish me luck…and I look forward to seeing where this takes me!